It is without doubt that the space missions and moon landings of the late 1960s and early 1970s were awe-inspiring events, remarkable feats of achievement and one of the very few occasions that made the world stop to witness such incredible accomplishments. A time of incredible scientific advancements, the decade saw the first instance of humanity setting foot on another surface of our solar system – a magnificent and groundbreaking event that cemented the decade in the history books. With NASA’s long held legacy of innovation and pushing boundaries, it is easy to forget about the men and the technology that equipped these brave missions of discovery to go where no man had gone before. 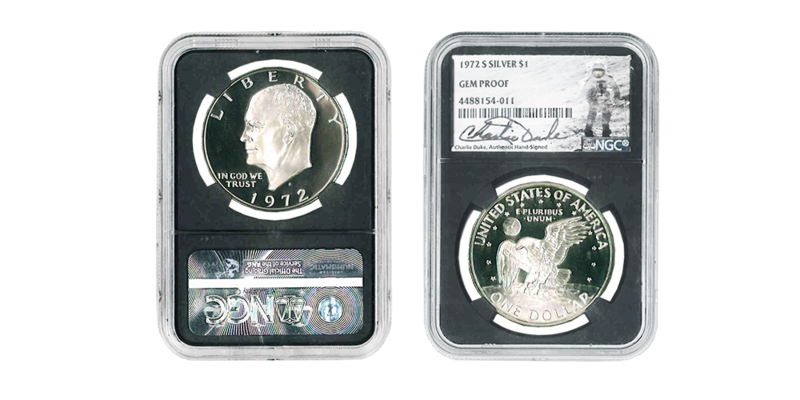 These events have been immortalized in more ways than one and on a symbolic occasion, the US Mint acknowledged the efforts of so few by striking a silver commemorative $1 coin with a design celebrating the moon landings in 1971. The reverse depicts the image of an eagle landing on the surface of the moon clasping an olive branch, created by US Mint chief engraver Frank Gasparro. The design is based on the mission patch of the Apollo 11 programme. This coin, struck in 1971, also coincided with the launch of Apollo 16, which set off into space around 1pm on April 16th. On board the spacecraft was Lunar Module Pilot Charlie Duke on his first journey into space and to this day, he holds the title of youngest ever astronaut to set foot on the Moon. One of just six astronauts still alive from the original twelve to walk on the Moon, Charlie Duke celebrates his 82nd birthday on Tuesday 3rd October and to mark the occasion, The London Mint Office have made the 1971 Einsenhower $1 available, and this particular edition has been hand signed on the coin capsule by Charlie Duke himself. A truly fitting link to a remarkable individual.